Common skin conditions in cats can range from coat issues to itchy rashes. The symptoms include scratching and over-grooming, as well as patchy spots and dry, flaky skin. While some irritations can be caused by infections, other skin conditions are caused by pests or allergies. Check in with your vet upon the onset of symptoms to locate the source and start an appropriate treatment plan. Abscesses and Sores – Injuries and bites can cause infections, especially if your cat is on the prowl outside. Animal’s mouths can transmit bacteria, should your cat be bitten, and abscess is the wound healing with an accumulation of white blood cells. Vet attention can help it heal properly. Allergies – From environmental to food, allergies can elicit reactions in cats that cause skin problems. Scratching the head or neck, chewing on the paws or base of the tail, or scratching the ears are all recognizable signs of allergies, but vets can see more severe signs such as hair loss and skin lesions. 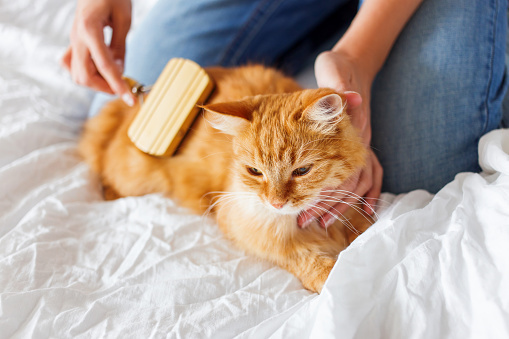 Compulsive Grooming – Caused by stress or painful conditions like arthritis, obsessive licking, chewing, or sucking on the skin and paws leads to irritation, thinning fur (alopecia), and even infection. Your vet can share some behavioral modification techniques to help curb this compulsion. Dandruff – Symptoms are obvious: you see white flakes in your cat’s fur. However, dandruff can indicate underlying problems – everything from ringworm (see below) to diabetes. Vets notice a correlation between dandruff and nutrition, hydration, parasites, health problems, or allergies. Treatment will depend on the ultimate diagnosis. Fleas, Ticks, Ear Mites and Lice – Parasites on their own can be a source of irritation, but an allergic reaction to them can make the experience downright maddening for your cat. In addition to causing blood loss and possible anemia, they can cause damage to the skin through your cat’s claws. Folliculitis and Acne – Folliculitis is an infection that causes little bumps or scabs on your cat’s skin, while feline acne typically appears on and around a cat’s chin. Caused by bacteria and exacerbated by stress and poor grooming, your vet may prescribe a special shampoo and even an antibiotic. Hair Loss – Unless your cat is hairless, alopecia and baldness is a problem that is indicative of a more serious disease. Vets see cats losing hair due to anxiety, hyperthyroidism, and food allergies (see above), plus ringworm (see below) and even mange. Mange – An inflammatory infection caused by mites, mange in cats is sometimes also called “feline scabies.” Little mites cause a severe and painful skin infection, generally starting on the face and ears and spreading to the rest of the body. Mange is highly contagious but is treatable. 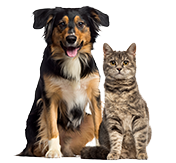 Ringworm – This common fungal infection can spread to humans and other pets in the house, so nipping it in the bud is imperative. Kittens are very susceptible to ringworm; check for the tell-tale circular lesions on your cat’s head, ears, and front legs. Treatment can include special shampoos, ointments, and even prescription meds. Skin Tumors and Skin Cancer – A lump or tumor isn’t necessarily cancer; however, it needs to be biopsied and diagnosed by a vet as soon as possible. Cats with lighter fur are especially vulnerable to skin cancer (and cats sure do love lounging in the sunlight), so be cognizant of the signs and prevention, especially in the eyes. Yeast Infection – Found usually in the ears, yeast infections are spotted by a black or yellow discharge, redness of the ears, and persistent scratching. Your vet will prescribe an anti-fungal that should help alleviate discomfort quickly, and clear up the infection within a week. Vets can spot most kitty skin conditions immediately, and with more advanced medicines than ever before, treatment is effective and quick. Healthy Paws covers most all skin conditions (exceptions apply) with our comprehensive cat and kitten insurance. After downloading our Cost of Pet Care report for more information on remedies for the above conditions, you can find out what to expect your vet bill to look like should your cat develop a skin condition. Then head over to get your free quote.